In 1952, Dr. Forest Dodrill captured national attention when he became the first surgeon to use a mechanical heart pump on a patient at Wayne State University's Harper Hospital in Detroit. There's a reason that heart pump looks like a 12-cylinder engine. It was made by General Motors. Automakers have had an impact in many areas beyond the traditional scope of developing cars and trucks — from paint and gasoline to solar cells, hydrogen fuel cells, and even the inertial guidance system for NASA's Apollo moon program. All were built by automakers. The first mechanical heart pump was no different. Dr. Dodrill believed that a machine could be developed to temporarily replace the human heart's blood-pumping function and make open heart surgery possible. Several previous devices had been used during surgery with animals. But the issues of how to preserve red corpuscles when blood was pumped through a machine as well as how to prevent blood clotting, hemorrhaging, and infection had to be addressed before a machine could be used for heart surgery on humans. Dr. Dodrill and his medical team called on a group of scientists and engineers at the GM Research Laboratories for help. 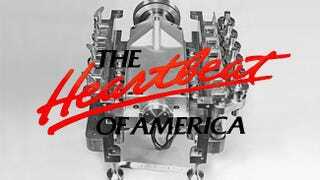 That result was the Dodrill-GMR Mechanical Heart, built by GM Research Laboratories and funded in part by the American Heart Association. Measuring 10 by 12 by 17 inches, the invention looked similar to a 12-cylinder engine with six separate cylinder-like chambers. Made of stainless steel, glass and rubber, the mechanical heart used air pressure and vacuum pumps to circulate blood from the 12 chambers through the patient's body while open heart surgery was being performed. The first patient — a 41-year-old Polish immigrant suffering from shortness of breath and chest pains — was admitted to Harper Hospital on July 3rd, 1952. His name was Henry Opitek. As a strange aside, Opitek remembers that when he was admitted to the hospital, he recalled seeing dogs romping on the roof of a nearby building. He wondered why each dog had a shaved chest. Later, Opitek learned they had been used in the final test of the mechanical heart before his own surgery. The operation lasted 80 minutes and the mechanical heart was used for 50 minutes to keep Opitek alive while his heart was repaired. In fact, Opitek survived for almost 30 years after the operation. With more sophisticated heart-lung machines under development by other medical engineering teams, GM donated the device to the Smithsonian Institution in 1954. Today, it remains in the Museum of American History Division of Science, Medicine, and Society's permanent collection of milestone medical devices and artifacts. "We've come a long way since that first heart operation by Dodrill in 1952. Now, it's estimated that worldwide more than one million open heart operations are done using some form of heart-lung machine each year," said Dr. Larry Stephenson, Wayne State University cardiothoracic surgeon and medical historian, in a press release in 2002. "Without some form of blood pump or heart-lung machine, many of the heart operations we routinely do would not be possible." The success of the Dodrill-GMR Mechanical Heart began a wave of research and medical advances that continue to this day.